Follow these writing tips to help you be considered for top account manager jobs. To be considered for top account manager jobs, resume expert Kim Isaacs says it helps to have a comprehensive resume. 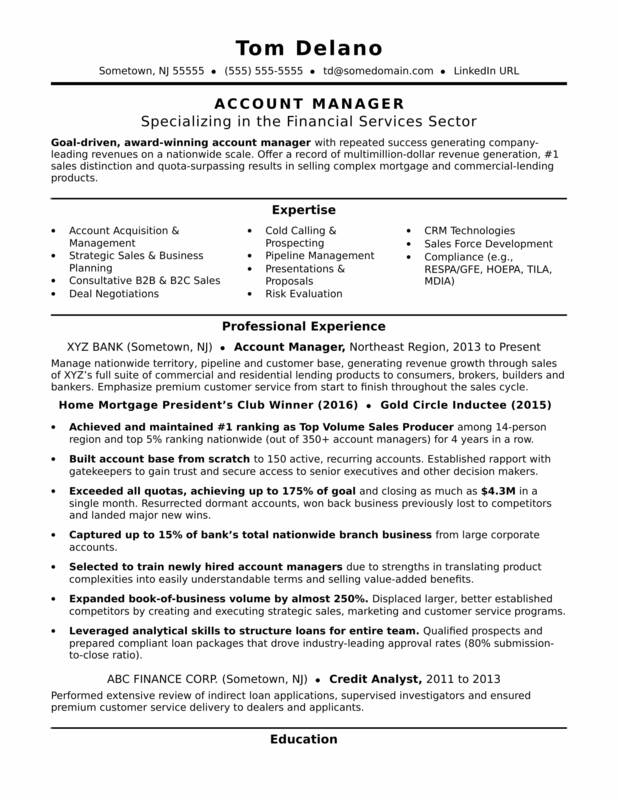 For resume writing tips, view this sample resume for an account manager that Isaacs created below, or download the account manager resume template in Word. Jobs for account managers are projected to grow by 7% (Or 28,900 jobs) from 2016 through 2026, according to the Bureau of Labor Statistics (BLS). You’ll find the highest level of employment for this job in the following states: California, Texas, Illinois, New York, and Florida; and in the following metropolitan areas: New York City, Los Angeles, Chicago, Atlanta, and Boston. As an account manager, you can expect to make a median wage of $121,060 per year, or $58.20 per hour, according to the BLS. Additionally, you can search for account manager jobs on Monster. Goal-driven, award-winning account manager with repeated success generating company-leading revenues on a nationwide scale. Offer a record of multimillion-dollar revenue generation, #1 sales distinction and quota-surpassing results in selling complex mortgage and commercial-lending products. Manage nationwide territory, pipeline and customer base, generating revenue growth through sales of XYZ’s full suite of commercial and residential lending products to consumers, brokers, builders and bankers. Emphasize premium customer service from start to finish throughout the sales cycle. Achieved and maintained #1 ranking as Top Volume Sales Producer among 14-person region and top 5% ranking nationwide (out of 350+ account managers) for 4 years in a row. Built account base from scratch to 150 active, recurring accounts. Established rapport with gatekeepers to gain trust and secure access to senior executives and other decision makers. Exceeded all quotas, achieving up to 175% of goal and closing as much as $4.3M in a single month. Resurrected dormant accounts, won back business previously lost to competitors and landed major new wins. Captured up to 15% of bank’s total nationwide branch business from large corporate accounts. Selected to train newly hired account managers due to strengths in translating product complexities into easily understandable terms and selling value-added benefits. Expanded book-of-business volume by almost 250%. Displaced larger, better established competitors by creating and executing strategic sales, marketing and customer service programs. Leveraged analytical skills to structure loans for entire team. Qualified prospects and prepared compliant loan packages that drove industry-leading approval rates (80% submission-to-close ratio). Performed extensive review of indirect loan applications, supervised investigators and ensured premium customer service delivery to dealers and applicants. Before you set off on a job search, it's critical to get your resume in order and make sure it highlights not only your qualifications but also the value you'd bring to the job. Not sure your resume is ready to go just yet? Get a free resume evaluation today from the experts at Monster's Resume Writing Service. You'll get detailed feedback in two business days, including a review of your resume's appearance and content, and a prediction of a recruiter's first impression. It's a quick and easy way to ensure you put your most professional foot forward.